simply from the change of momentum. Keep reading to learn the impulse equation and never worry about calculating the momentum again! Delta (Δ) is a symbol that means "change". For example, while p is the instantaneous momentum, Δp depicts the change of momentum that occurred over some period of time. Head to the conservation of momentum calculator to discover the practical applications of momentum. Units of both momentum and impulse are newton-seconds (symbol: Ns), which are expressed as kg*m/s) in SI units. 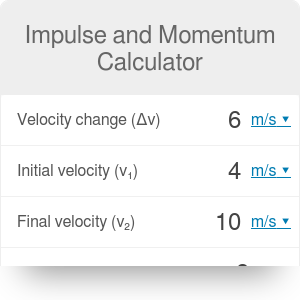 You can type the values of initial and final momentum into our calculator to find the impulse directly from the impulse formula J = Δp. You can also enter the values of mass and velocity change of an object to calculate the impulse from the equation J = m * Δv. If you know the force acting on the object, enter the values of force and time change instead. Our impulse and momentum calculator will use the J = F * t formula. The concept of impulse is connected to kinetic energy - make sure to read about it as well! Impulse and Momentum Calculator can be embedded on your website to enrich the content you wrote and make it easier for your visitors to understand your message.